Hey you guys! 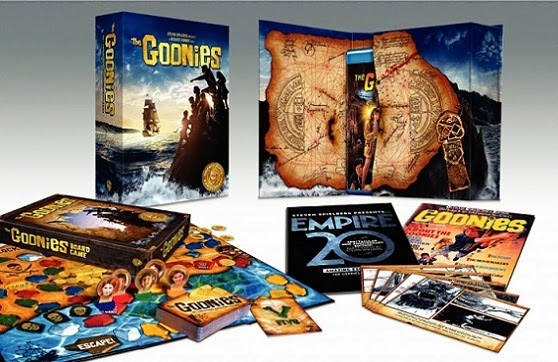 One of the greatest movies of the 80s is finally on Blu-ray as The Goonies 25th Anniversary Box Set with some fun extras. I’ve always loved this movie and I think this was a one of those rare movies that is a part of our cultural landscape and loved by most of my generation. You can’t go wrong when the movie was conceptualized by Steven Spielberg, written by Chris Columbus, and directed by Richard Donner and has a fantastic cast. The whole premise that kids my age could go on an incredible adventure and find pirate treasure and have sword fights on an actual pirate galleon was just irresistible to me and it still is to this day. This is a fun family movie that successfully mixed action, comedy, swashbuckling, and a dose of reality which is rare and hard to pull off. 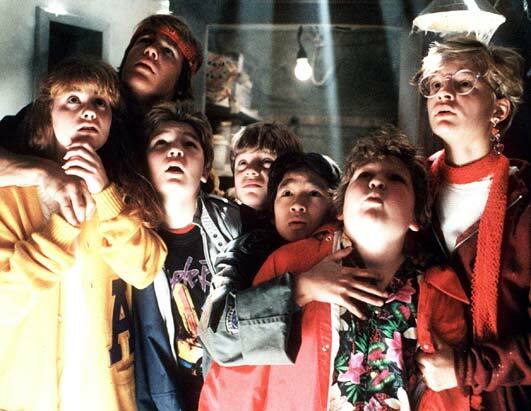 I think every generation has adventure tales that speaks to them, whether it’s Tom Sawyer or Huckleberry Finn, or the Star Wars, Indian Jones, or the Lord of the Rings movies, but one of the biggest and most unlikely entries from the 80s was The Goonies. This was basically the lite version of a combination of Indiana Jones and Errol Flynn movies mixed with a dose of youthful humor. 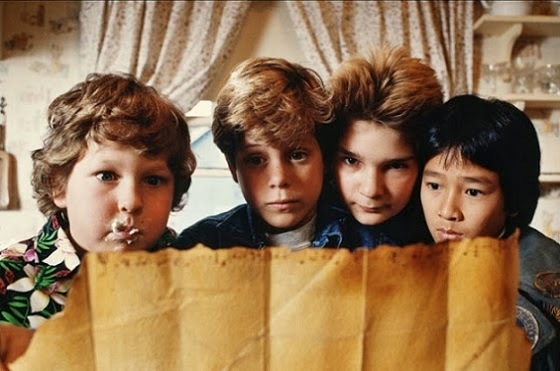 I think a lot of people from my generation have very fond memories of the 80s Amblin movies and The Goonies was one of the best of the bunch. The movie takes place in Astoria, Oregon where a group of friends that live in the “Goon Docks” area (hence their nickname) are about to lose their homes due to foreclosure thanks to the local Country Club that wants to knock all of their houses down to build a golf course. Mikey (Sean Astin) and Brand’s (Josh Brolin) father is doing all he can to prevent that but it’s a futile effort because there’s no way he can raise enough money in time. When an old pirate map is discovered by Mikey in their attic, he convinces the other friends to join him on one last adventure before they all have to move away from each other. 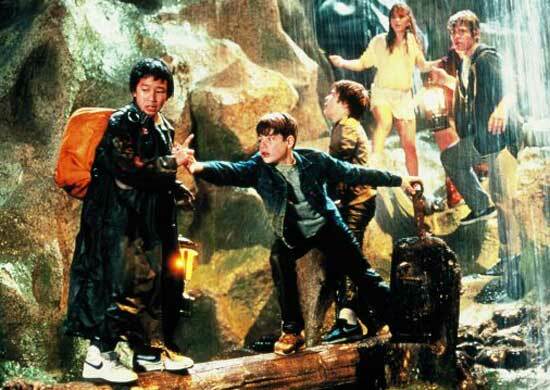 The prospect of possibly finding some pirate treasure from legendary pirate One-Eyed Willie convinces Data (Ke Huy Kuan), Mouth (Corey Feldman) and more reluctantly Chunk (Jeff Cohen) to join the search. They are later joined by Brand who finally catches up with them along with Andy (Kerri Green) and Stef (Martha Plimpton) who have abandoned the preppy and stuck up guys they were with to be with Brand. When the map leads to a shuttered restaurant that is closed for the winter, they all get a surprise when they discover that the local crime family known as the Fratellis are hiding from the law inside along with their deformed brother Sloth (John Matsuzak). The Fratelli Brothers Jake (Robert Davi) and Francis (Joe Pantoliano) spend most of their time fighting each other and the rest of the time getting slapped by their mother (Anne Ramsey). Hidden in the fireplace, the group finds a hole that leads to the tunnels underneath the restaurant which put them on the path to discover whether or not there is any hidden treasure. But to reach the treasure they quickly learn that they will need to survive the many lethal booby traps that have been left behind by One-Eyed Willie. One nice aspect of the movie is that everyone in the group has different strengths and weaknesses but they band together and their combined abilities offset their individual limitations. It’s also great to see kids act like real kids with each of them speaking over each other in excitement and the natural energy that all kids possess hasn’t been diluted like usual. Even their dialogue feels real and unforced which allows the young cast to act naturally and as if they’d been together for years. And what a great cast this movie has! Each one of these roles was perfectly cast and I can’t imagine anyone else in these roles. Even the supporting characters like the Fratellis could have had their own movie and it would have been great. 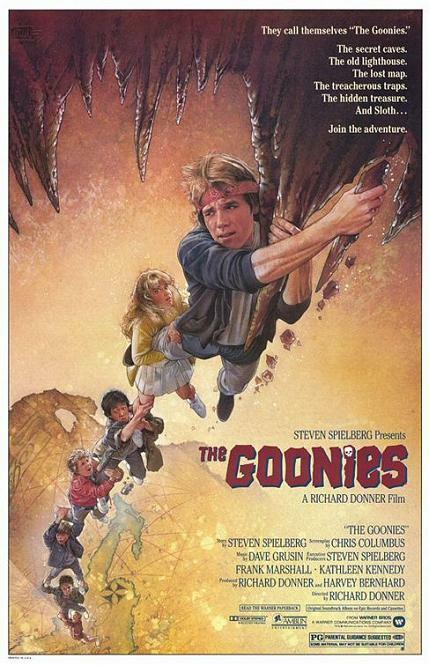 It shouldn’t come as a surprise to anyone that this is a fantastic movie as the concept came from Steven Spielberg who was on a roll in the 80s as a director and as a producer and also because of the talents of the director Richard Donner, who was also on a roll after directing Superman, The Omen, The Toy, LadyHawke, and of course after-wards the great Lethal Weapon franchise. Chris Columbus who wrote this screenplay went on himself to become a successful director in his own right with the first two Harry Potter movies among others. Across the board, this movie had some of the best in the business working on it and it shows. From the amazing set design, to the editing, the score, and the cinematography, this was a first class production disguised as a kid’s movie. The movie has become a touchstone for many people and there’s been talk of a sequel for years and even more recently the concept of making it a Broadway show. I’m not sure why they never made a sequel to this after it was released, but I believe it reflects a rare misstep by Spielberg who isn’t averse to sequels. This new 1080p VC-1 transfer is definitely better than the previous DVD releases but it isn’t as good as I was hoping it would be. The black levels are deeper than before and there’s more detail but there are still scenes that are washed out and inconsistent. On the plus side, the colors look a lot better and the studio didn’t overuse DNR which I thought would happen and there is a lot of grain present. There’s some minor specks and dirt present as well but that’s to be expected with a release this old. Unless the studio spends a fortune restoring it like they did with The Adventures of Robin Hood, this is probably about as good as we are going to get. When I heard that they had remastered the sound, I had heavy expectations for the new English: Dolby TrueHD 5.1 track but I was left a little disappointed by this track. It’s better than the earlier releases but for a movie like this that could have so much ambient atmosphere in the pirate cave, it was a letdown that they didn’t utilize the surround channels as much as they could have. This is a front heavy mix and although the dialogue is clear and prominent, I wanted more action from the satellite speakers which were only used occasionally. The sub-woofer got more attention and I was pleased about that but overall, this wasn’t as good as I was hoping for. As this is the 25th Anniversary edition, I was hoping that we would get some new extras or at the very least a retrospective documentary that covered the production of the movie and recent interviews with the cast and crew. Unfortunately, we don’t get any of that but instead we got physical extras inside the box set which are cool but should not have taken the place of new extras. All of the extras from the previous Special Edition DVD have been ported over and the only new extra on the disc is the option to view the video footage of the cast and crew commentary session. None of these extras are in HD. Cast commentary with director Richard Donner and all seven actors - Very fun to listen to but at the same time a little frustrating as each of the cast members (especially Corey Feldman) cut each other off so a lot of stories are never finished or hard to understand. I still really enjoyed it though as it was great hearing them all back together along with Richard Donner. There is also an option to watch the movie with video clips of the commentary interspersed with the movie. I would recommend this option to anyone that wants to hear the commentary because not only is it fun to see the cast interacting, but it also makes it easier to understand them as their talking overlaps quite a bit. You will get all of the same commentary but every now and then, you will get to see them as well. I wish they had just left it as a picture-in-picture video commentary with the movie displayed in a small box at the bottom of the screen and allowed us to see the whole thing instead of snippets of it. The Making of The Goonies documentary – This a short look into the making of the movie and it’s basically looking at the struggles that Richard Donner faced while directing seven kids. At one point, he half-jokingly claimed he was going to commit suicide. We also see Steven Spielberg on the set helping out and taking the Goonie oath along with the cast. Cyndi Lauper music video “The Goonies ‘R Good Enough”- I don’t remember seeing this two part music video that stars all of the cast except for Kerri Green and a lot of wrestlers. This video is beyond weird, but it does make use of the movie’s sets and even has Steven Spielberg in it! Theatrical trailer – The original theatrical trailer. I love seeing old trailers and how different they were made back then. Deleted scenes – Some deleted scenes that could have easily gone in the movie except for the one that had a cheesy fight with an octopus. The scene from the convenience store has some good laughs and Chunk gets stuck in an ice cream freezer while sneakily trying some. Includes new board game – I haven’t played this yet but it looks to be oriented for kids and 2-4 players can play it. It looks kind of cool. Original movie storyboard reproductions – These are cool but probably will only interest die hard fans. 1985 souvenir magazine reprint – A nice time capsule of the movie with cast interviews included. Reprint of 2009 Empire Magazine article with photos from the cast reunion – I really enjoyed reading this when it came out and it’s nice that they’ve included this as part of the set. If you ever wanted to know what the cast looks like or what they are up to now, this is a great read. Although I love the movie and rated it as a five, I have to give the overall package a rating of four because of audio/visual quality not being up to the standard I feel it should be at, and also because they didn’t offer any new extras of substance. While I enjoyed the reprints and I think the game is a nice new twist, I think that for an anniversary edition, more effort should have gone into digital extras and they all should have been in HD. I’m probably being more generous than I should be on this final score, but I love the movie and they did a nice job with the embossed box set. If you already have the special edition DVD then it’s up to you whether or not you want to upgrade, but if you don’t have that then you should pick this up for sure.